The following pages explain the function of specific groups of characters in the production. This information will assist directors and production staff in making informed casting, staging, costuming, and design choices. In creating a story from the scriptural and historical records, several fictional characters have been added to Savior of the World to assist in moving the plot forward. These fictional characters are Ezra, Benjamin, Micham, Micham’s nephews, Aaron, Joshua, and Rebekah. Other characters, which are unnamed in scripture but mentioned in the historical record, have been given names in the production in order to clarify references to them. These include Mary’s family and the shepherds Nathan, Eli, Asa, Reuben, Jeshua, and Amon. In order to incorporate important Messianic prophecies into the Savior of the World production, the script includes several instances in which prophets speak from the colonnade. These scriptural commentaries clarify the eternal significance of the action below and are drawn directly from the Bible and Book of Mormon. Prophetic utterances should be treated with reverence and respect. In each instance, the on-stage dialogue pauses briefly, though appropriate stage business may continue, as Malachi, Abinadi, Micah, Luke, or Samuel the Lamanite speak. In most cases, prophets can be costumed simply with the addition of a white or cream drape over their basic robe. 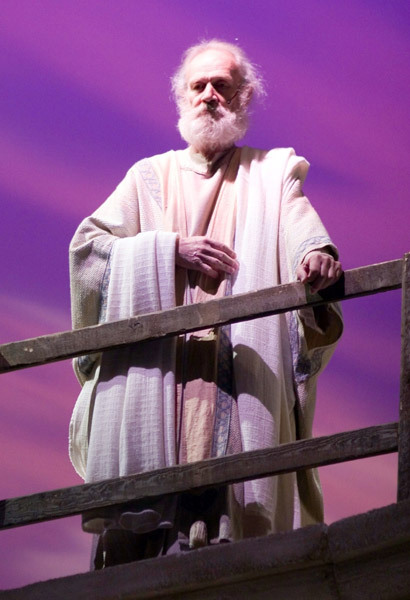 In the Conference Center Theater production, Nephi, who appears both in the temple scene and later when Mary visits Elisabeth, was given a specific costume patterned after Arnold Friberg’s paintings (see Costumes).